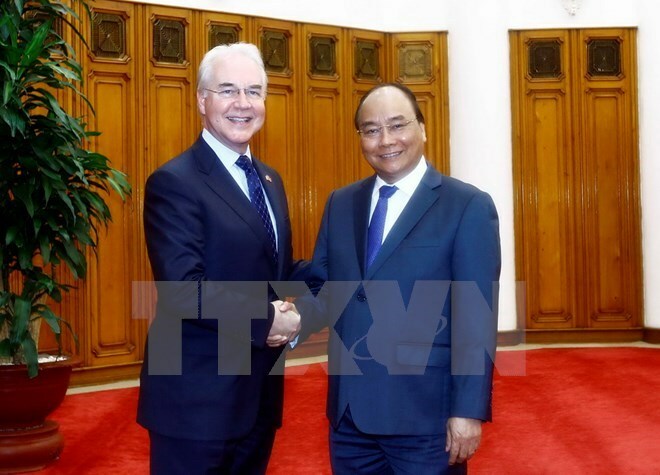 Hanoi (VNA) – Prime Minister Nguyen Xuan Phuc hosted a reception in Hanoi on August 24 for US Secretary of Health and Human Services Thomas Price who has been in Vietnam to attend the APEC High-level Meeting on Health and the Economy. PM Phuc applauded the efforts to develop medical cooperation between Vietnam and the US over the past 20 years and expressed his satisfaction with the signing of a Memorandum of Understanding (MoU) on cooperation between the two health ministries during the US official’s ongoing visit. The PM affirmed that the Vietnamese Government appreciated the US Government’s cooperation and support to Vietnam’s health sector through programmes such as the US President’s Emergency Plan for AIDS Relief (PEPFAR) and the Global Health Security Agenda with the opening of offices on epidemics alert and response launched by the General Department of Preventive Medicine and the National Institute of Hygiene and Epidemiology of Vietnam. The Vietnamese Government also highly evaluated the efforts by relevant ministries and agencies to strengthen medical cooperation, particularly the US Embassy in Vietnam, the US Centre for Disease Control and Prevention, the US Agency for International Development, and US non-governmental organisations, he said. PM Phuc believed that bilateral medical ties will further thrive, particularly in the fight against HIV/AIDS, influenza prevention, global health security and potential cooperation areas such as training of medical staff, granting of national vocational certificates, global health diplomacy, food safety and pharmaceuticals. The PM asked the Secretary to convey his regards to President Donald Trump and expressed his hope that during the President’s term, the Vietnam-US comprehensive partnership as well as medical cooperation between the two nations would develop further. Secretary Price, for his part, conveyed President Donald Trump’s greetings to the PM and his appreciation for bilateral ties in different areas, including healthcare. The US highly valued Vietnam’s achievements in ensuring global health as well as preventing and controlling epidemics diseases and HIV/AIDS and wishes to further enhance ties with Vietnam in the field, he said.